Wanna know how to snag your crush this summer? Follow our dating tips! ​Live by the beach? Have a bonfire with a few carefully selected attendees. Sitting around a fire is romantic, plus there will be perfect opportunities for you to snuggle up with your special friend! Bring some ingredients for Smores, maybe a little hot chocolate? Great summer night! Go on a bike ride! It doesn’t matter where you go, just cruise along! Fun and easy conversation will arise from your adventures, and there is nothing more attractive than a girl who can go with the flow! Have a picnic! Once you have established a little connection between you and your man, invite him to a cute little picnic in the park! Bring a blanket, some sandwiches, sodas, and yummy treats. We all know the way to a man’s heart is through his stomach, so try and do some deep digging and figure out his favorite snacks! Lounge around and enjoy each other’s company, this is a great way to get into some deep conversations too! Are you and your crush the athletic type? Challenge him to a 5k race, half marathon, or even more flirtatious, a mud run! He’ll be impressed by your creativity and active ideas. Plus, what’s more fun than getting a little muddy with your man? Grab some friends and head to a concert! This is a great activity if you and your crush haven’t quite had that moment… when you dancing with him during your favorite song, give him the look and wait for the kiss! 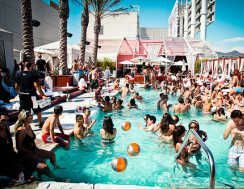 Throw a pool party! Invite over all your girlfriends, and then decide which boys to invite. Have pool toys, snacks, lemonade… the perfect recipe for a fun party in the sunshine! Plus, there will be plenty of opportunities for you flirt with your crush!